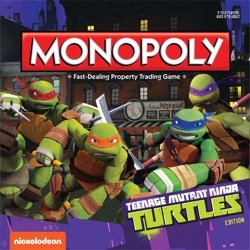 A large selection of junior editions of the Monopoly Game is shown below. Join Rich Uncle Pennybags for a day at the Boardwalk amusements. Set up ticket booths, then add, subtract and even multiply as you collect fees when other players land on your booths. Chance cards send you around the colorful carnival board: maybe you'll go to the fireworks - or pay $3 to take the tramway to the restroom! Sooner or later, somebody will run out of money and the game ends. Count up your cash: if you've got the most, you win this junior game that's big fun! For 2 to 4 players. Game includes: game board, deck of 24 chance cards, 48 ticket booths, play money, die and four car movers. Packaging art may vary. Just like its big brother, Monopoly Jr. is big-time fun for everyone! Join Mr. 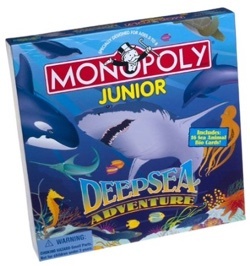 Monopoly in his submarine as he introduces kids to the exciting world of Monopoly and the fascinating creatures in the ocean. Players buy different marine animals for their aquariums (like the Great White Shark, Sea Otter and Octopus) and charge other players to see them. The diver with the most money and the most aquariums wins the game in this Deep Sea Adventure. 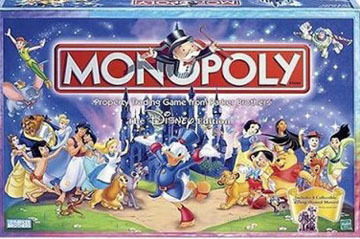 This version of the Monopoly Game features all your favorite Disney characters. Properties are represented by cottages, and the Prince's property by a castle. Solid pewter collectible game pieces feature Snow White, a coupled Lady & The Tramp, Cinderella, Pinocchio, Dumbo, Alice, and Baboo. Scrooge McDuck (who else?) 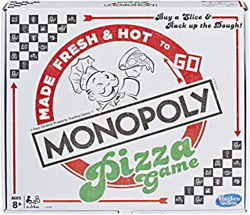 is featured on all Monopoly money in place of Rich Uncle Pennybags. 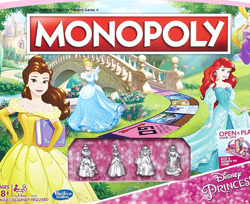 Disney Monopoly is an absolutely enchanting edition of the classic game of Monopoly! There's a lot of wheeling and dealing going on at the Disney/Pixar-themed movie lot. How much would you pay for Edna Mode's mansion? How about the Parr's family home? Or maybe Gill's Pirate skull is more to your liking. Travel the board as your favorite Disney/Pixar-themed token. Collectible tokens include Buzz Lightyear, Boo and Sulley, Nemo, Mr. Incredible, Lightning McQueen and Remy! 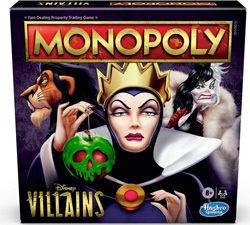 Monopoly; Disney Villains Edition Game lets you relive the excitement of all your favorite Disney villains -- from Chernabos to Ursula -- with this very special edition of the classic Monopoly; board game. Magic Mirror and Cauldron cards might make your dreams come true or they might bring an unexpected trip to jail. Use your Wishes wisely to collect the deeds to Disney Villains belongings; increase their value on your way to victory! 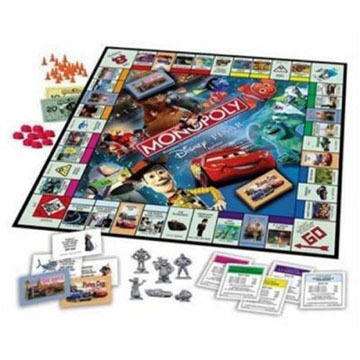 Combine Monopoly Jr. game play with the popular shows and movies from the Disney Channel line-up - Choose your favorite Disney Channel personality and run around the gameboard buying properties as you go! Try to set up as many televisions as possible to collect money from your friends each time they stop and visit. Play as characters from Hannah Montana, Phineas & Ferb, Jump In!, The Cheetah Girls, Return to Halloween Town, High School Musical, Cory in the House, That's So Raven, and The Suite Life of Zack & Cody. Collect the most money by the end of the game and you win! Gameboard comes with 24 chance cards, 48 plastic televisions, die, pretend money, 8 pawns, 4 stands, label sheet and instructions. 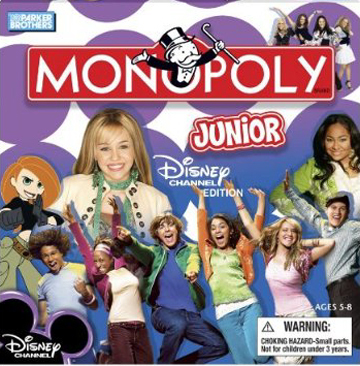 Pawns include: Hanna Montana, Zack & Cody, Raven, Gabrielle & Chad, Marnie, The Cheetah Girls, Cory and Kim Possible. For 2 to 4 players. 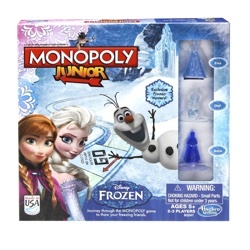 Thaw your frozen friends in this Disney-themed Monopoly game for kids! 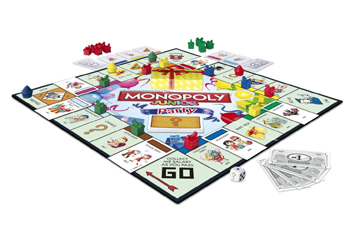 The fast-trading property game meets the power of snow and ice in this Monopoly Junior game. Kids will join Anna, Elsa and Olaf as they travel through Arendelle and buy its most magical locations. Whoever collects the most cash will thaw their freezing heart and win! 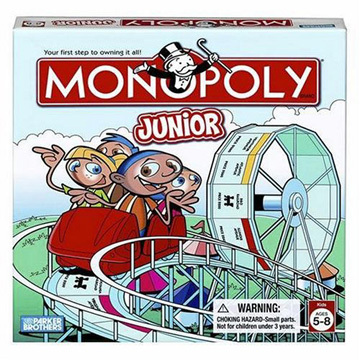 Specially designed for playing with kids 5 to 8, the Junior version of the world's most popular board game takes the players to the amusement park. You're bound to have fun -- and it's great for working on math skills! 2-4 players. "Howdy, Ho!" 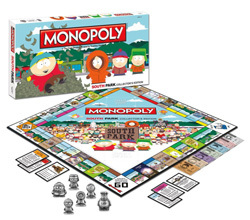 It's the super-sweet South Park Collector's Edition of Monopoly®! Take over South Park Elementary or own Imaginationland. All the famous locations of South Park are yours...for the right price! Join Stan, Kyle, Cartman, Kenny and Chef as you buy, sell and "Roshambo" your way through this quiet mountain tow. Make your fortune and Cartmanland can be your very own, private amusement park. Lose everything, and you may become the poorest kid in South Park.